"My mother made a layered version of this when I was younger. Now that I am a wife and mother of 2, I have found my own way to make this even easier without losing the wonderful Italian flavor. Best served with a simple salad and lots of garlic bread. This is a must have in your recipe box!" Preheat oven to 350 degrees F (175 degrees C). Bring a large pot of lightly salted water to a boil. Add ziti, rotelle and seashell pasta and cook for 8 to 10 minutes or until al dente; drain. In large skillet, cook ground beef over medium-high heat until brown. Drain. In large Dutch oven, combine pasta, ground beef, cheddar, mozzarella, pepperoni and pizza sauce, stir well. Sprinkle Parmesan over all and bake 45 minutes, or until top is golden and bubbly. 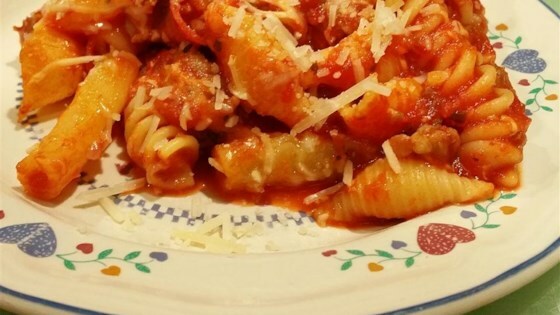 See how to make Colleen's five-star baked ziti. This recipe is perfect! It makes an amazing dinner, even my kids love it. I add Italian sausage to it, but other than that, I wouldn't change a thing. "We found it to be a good recipe. I did add more pizza sauce and I also layered this dish. Kids liked it, will make again." Super easy! I used ground turkey instead of beef, and omitted the cheddar cheese (didn't think it went with an Italian-style dish). Turned out great! Thanks for the recipe! Yummy! Its like pizza casserole. I added mushrooms, and extra cheese and pepperoni. Good stuff!